What is a video sender? Video senders (also known as AV senders) allow you to send TV signals around your home without wires. They use radio waves to send the signals, and you need a transmitter and a receiver. 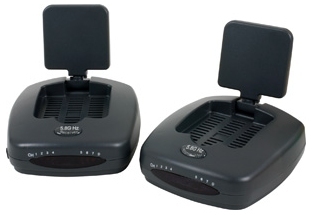 You can buy a pair of video senders for around £30, and they’re a great way of sending TV signals around the house without running aerial cables. You can use a video sender with a Freeview box, Sky Digital satellite TV box, DVD player, or a home security system. They can transmit over fairly short distances, through walls, although if you’re trying to transmit through several walls, or over a long distance, they can be less effective. Connect the output of a set-top box, DVD player or other video source into a transmitter (normally via SCART). Then connect the receiver to your second TV (again, normally via SCART). Signals are sent over the air. Range: The 2.4GHz version has a range of up to 80 metres, but this reduces the more walls / floors the signal has to go through. The 5.8GHz versions go up to 120 metres. You can also get very long range senders, with ranges up to 5000 metres, using really powerful aerials. I’m getting interference. What can I do? Most models of Video Sender allow you to change channels, so’s not to cause interference. Try changing the channel both at the transmitter and receiver end, and trying again. lf you’re getting interference from a wi-fi wireless network, we’ve heard that the AV sender from Gizoo might be worth a look, as it has 4 selectable channels. Can I send HD over a video sender? for equipment that will allow you to send HD video from an HDMI socket to a second HD TV set. I have recently bought a 2.4GHz AV wireless sender and have connected the transmitter to my sky+ box and the receiver to my TV in another room but nothing is working !. Do I need to do anything with the TV tuning wise?. Hi Alan. Assuming you have plugged the receiver into a SCART socket, you’ll need to set the TV to the Line In (e.g. AV1, AV2), and make sure both the transmitter and receiver are powered up. Hi,My video sender is plugged in to my sky plus box and the back of my tv in the bedroom,they are also both plugged into the sockets(power).They do not seem to be working,what could i be doing wrong. hi, can u please tell me how to change channel from the receiving end? Tried using the remote of both the transmitter(sky box) and the receiver(second tv) on the second tv but it does not seem to work. If you could help me out that would be really great, thanks. Someone suggested it might be to do with wifi. Is there a system that wouldn’t be upset by wifi. What equipment do I use to get Radio only from my lounge to my upstairs bedroom from my Sky + Box. Can I just pick up the radio signal on another device that is not a TV if so what is it? (I am in effect looking for what used to be a Sky Gnome. Thanks for any help. Do these work if the main TV is a Freeview TV & I don’t have a separate set top box? I wonder if it possible to send a simple satellite signal to another room. What I mean is, in my living room I have a sat box connected to the TV via Sat1. I have a Sat2 connection that I wish to connect another box in the bedroom, but I dont want to drill through walls and have long cables everywhere. Also, I dont want to just send a signal of what on TV in the livingroom as that means I will have to goto the livingroom to change channel? So is it possible to send a signal from Sat2 wall connection to a receiver in my bedroom that I can attatch to a different satbox and scan for channels with? Thanks, and sorry if its long winded. I do hope its clear. You have dealt with video signals, but can you take an aerial output and pass it through the wiring in the house much as you do with broad band extenders. Hi, I have an aerial into the house, in the living room but I require a feed in the bedroom, I cannot run a cable. The bedroom television only requires an aerial connection. Could please advise how I could achieve this? We have the main television in the sitting room. I HAVE JUST HAD NEW KITCHEN DECORATED & FLOOR INSTALLED ! TV AERIAL CABLE NOW 10M AWAY ON WRONG SIDE OF ROOM CANNOT GET CABLE ACROSS ROOM. HOW CAN I TRANSMIT TV SIGNAL ACROSS ROOM? INDOOR AERIAL DOES NOT WORK IN THIS AREA, ALL HELP APPRECIATED. When using a video sender, can i take the signal directly out of the back of my TV,I do not seem to have a line out of any kind on my TV .?? I do not have a anything to get the signal from like a set top box and my TV has the antenna plugged directly into it ..?? I have a TV sender which is a digital 5.8GHz model. The picture reception is very good but unfortunately the sound on the receiving set is delayed by approximately 1 second. As the second set is close by and through an arch the delay can be heard very easily and it makes it impossible to hear the sound clearly. Have you any suggestions please. I am looking to use a video sender to transmit my sky box from downstairs in my house to the tv upstairs. I live alone so the televisions will never be watched simultaneously, however when watching sky on the tv upstairs will I be able to change the tv channel, access sky tv guide etc (meaning the channel would also change downstairs), or will I have to go back downstairs to change the channel?